The German astronomer Gottfried Kirch discovered its variability in 1686, when in July of that year he observed that the star had disappeared from the sky, not being visible again until the month of October. Khi Cygni (or Khi Cyg) brightness oscillates between apparent magnitude 3.3 and 14.2, the greatest change of luminosity known in a star except for outbursts of novae and supernovae. Khi Cygni is a red giant of spectral type S (its spectral class is S6,2e to S10,4e) similar to those of type M, except that the dominant oxides in their spectrum are those formed by metals like zirconium and yttrium instead of titanium, scandium and vanadium. The S-type stars have intense bands of cyanogen (CN) and contain spectral lines of lithium and technetium. Over 106,000 observations are in the AAVSO International Database (https://www.aavso.org/vsx/index.php?view=detail.top&oid=13285) and the original observations from Kirch back in 1686 appear in the AID! According to Thomas Karlsson (http://var.astronet.se/mirainfooc2.php), the mean period of 408 days has oscillated between 403 to 413 days since its discovery, as we can see in this diagram below. 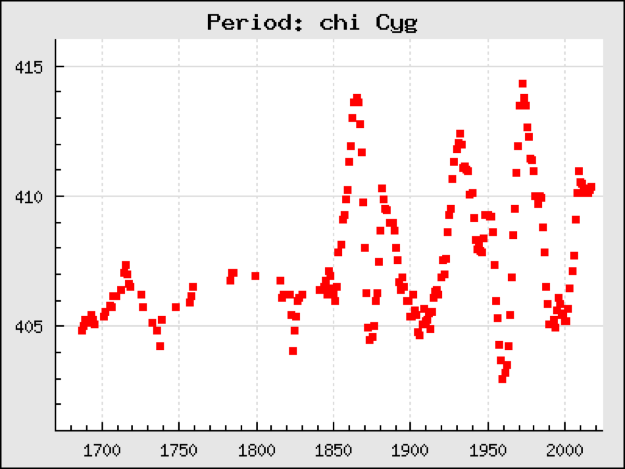 The oscillations seem to have become more pronounced after 1850. 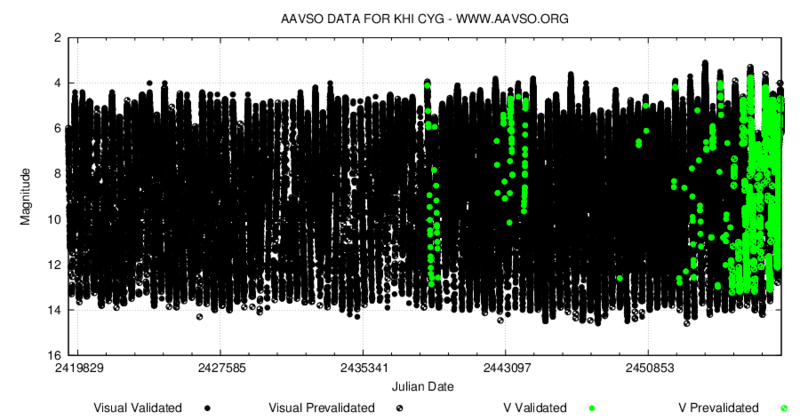 This variable star has been followed by AAVSO observers since its foundation. 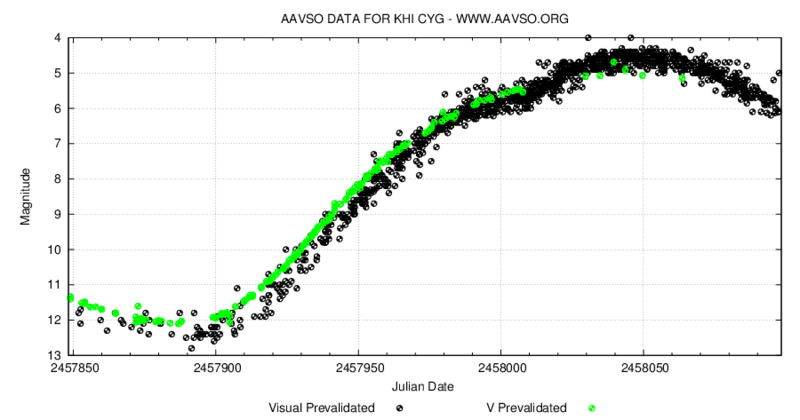 The lightcurve below shows all of the observations for Khi Cygni that are in the AAVSO International Database. Like in other Mira stars with long periods, Khi Cygni develops " humps" or "standstills" in the ascending branch of the light curve. Light curves for many cycles of Khi Cygni show that hump can move in phase and magnitude. 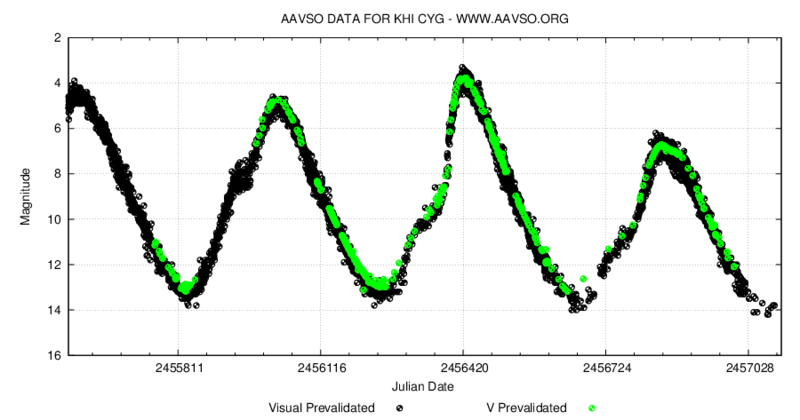 This behavior is more evident in the following light curve. Khi Cygni is contained in the list of LPV Humps maintained by Frank Schorr (https://www.aavso.org/lpv-humps) and is a good target for all observers equipped with binoculars, near the maximum brightness, and modest telescopes (10-12 inches) when it is near minimum.